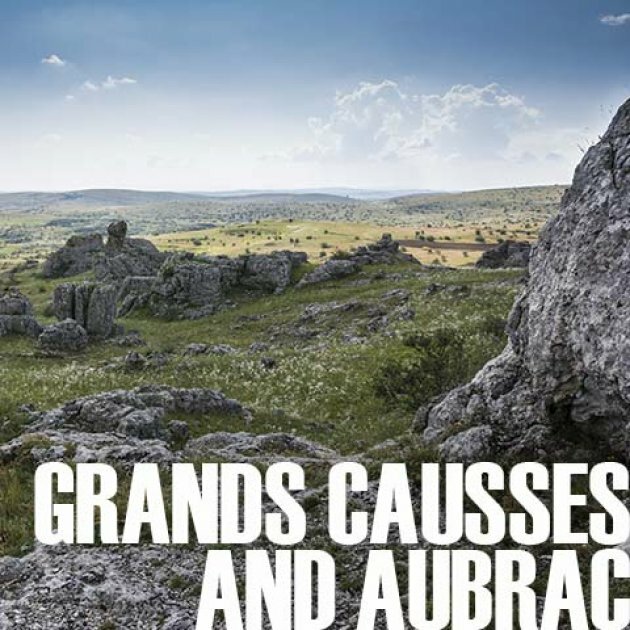 Our tour across the Grands Causses and the Aubrac in 7 days, up to 10 persons. 3 double overnight stays. Flights from other German airports as well as from other countries on request. A trip by eBike through great landscapes with memorable wide views and narrow river canyons, on deserted paths and to picturesque villages. Living in comfortable manors and haunted castles, travelling in a small group along a still untouched region in South-Western France. The number of guests for this tour is limited to 10 because of the special hotel situation. Trip to Montpellier on Saturday. Booked by you or by pedelon at your request. Flight to/from Montpellier. From Cologne, Munich and Stuttgart, you can reach Montpellier by train in 9 to 12 hours with one transfer, in 12 hours from Hamburg and Berlin, two transfers cannot be avoided. Continuous motorway connections to Montpellier. You may keep your car in a public parking garage near the hotel during the bicycle trip (approx. 70 € /week). 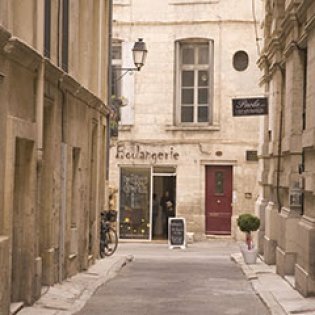 With your booking confirmation, you will receive the “pedelon travel information”, which contains useful notes on travelling to Montpellier and other advice around your trip. In Montpelier, the charming hotel „Le Guilhem“ will be waiting for the pedelon guests. The small town hotel in a former town palace has tastefully designed rooms. At 7 PM, you will meet in the hotel hall for an evening‘s town tour through the pulsating city of Montpelier. Past the cathedral Saint Pierre, the famous botanic garden Jardin des Plantes and the aqueduct de Saint-Clément, the tour will end in a popular evening restaurant in the old town. 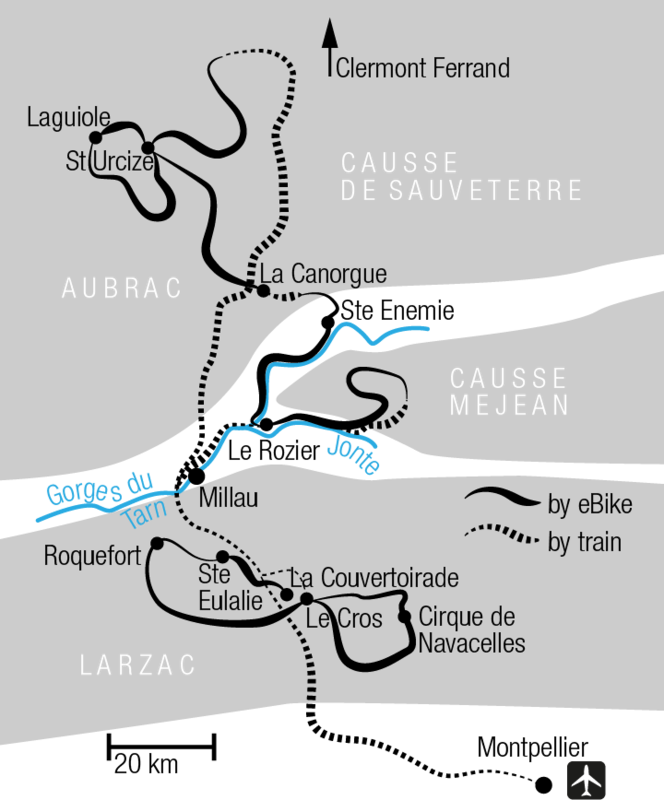 In the morning, the bus will take you on the Causse de Larzac in a bit more than an hour. There you will receive your eBikes and comfortably get used to them on your round trip on the southern-most lime plateau of the Grands Causses, a UNESCO world cultural heritage since 2012. 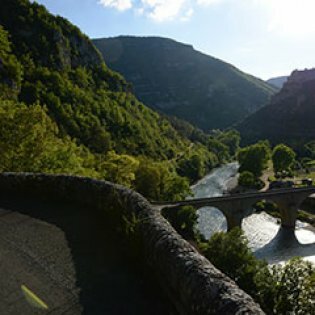 It is between 650 and 1,200 meters above sea level and is limited in the North by the nearly 500 meters deep Tarn gorge, and in the East by the Dourbie gorge and the Cevennes. The cycling section will lead you through a scarce, dry and nearly abandoned landscape, with juniper and holm oak as your constant companions. Now and then, you will find picturesque small settlements and villages that offer a unique language of forms thanks to their regional styles. Suddenly, the bicycle route passes a grandiose nature event: the Cirque de Navacelle. The huge valley was shaped by the small river Vis, which passed through a pressure meander here and shortened its run in a waterfall. Because of its picturesque and often gorge-like valleys and popularity for bathing, the canyon is much visited. On silent paths where there are only few cars, you will reach the Château du Cros, a picturesque place where you will spend the next two days. The five comfortable rooms of the defensive castle have been tastefully furnished with antique as well as modern furniture. In the evening, you will meet for an excellent dinner in a very good Auberge near the hotel. After breakfast in the Knights’ Hall of the former fortress, today’s stage begins with a visit to La Couvertoirade, a Templars‘ village from the 12th century. This medieval jewel is special because of its closed architecture. After this visit, you will ride your eBikes on the mostly flat path to Ste Eulalie de Cernon. This picturesque place once housed the Commanderie of the Knights Templar, from where they managed their possessions on the Larzac. After a walk across the pretty town with is small alleys and places, you will continue along the Cernon downriver towards Roquefort sur Solzon. The famous sheep‘s milk cheese has been produced in the labyrinthine caves here for a long time. During the tour of a Roquefort cheese production, you will learn lots about how this elaborate cheese is made. In the late afternoon, after a small transfer, you will return to the Château du Cros. If the weather is nice, an aperitif with a view of the castle park is offered before you meet for dinner in a well-frequented auberge. In the morning, the bus will take you across the famous Viaduct of Millau. 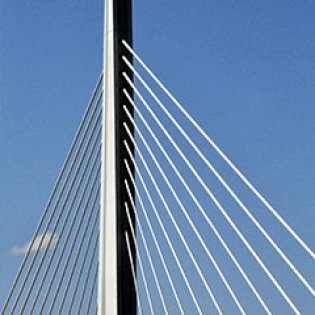 Designed by Norman Foster, it is the world‘s largest cable-stayed bridge at a length of 2.5 km and a maximum pillar height of 365 m. After a photo stop, you will reach the Aubrac a little later. This nearly treeless, slightly wavy plateau is reminiscent of a prairie and rather unusual for France. 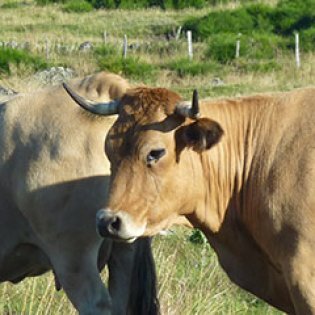 The Aubrac is thinly settled and only used for cattle breeding. Apart from the village of the same name, there are nearly only individual farms and former herdsmen‘s cottages, now abandoned. After a few kilometers by eBike, the powerful Château de la Baume will appear by the side of the road. Built at an elevation of 1200 meters, it is France‘s highest castle. The slightly strict but impressive building dates from the 17th century and is known as the „Versailles of Gévaudan“. In the early evening, Fred Remise will be waiting for his guests in his carefully restored manor house in St. Urzice, in the middle of the Aubrac. His luxurious guest house has five tasteful rooms, all of them with large bathrooms. Fred is known well in the Aubrac. He takes care of „his“ region with great commitment. Before a dinner typical for the country, he will offer a small guided tour of the beautiful village church from the 13th century. 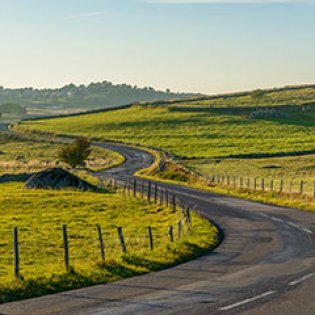 After breakfast in historic walls you will cycle on lonely paths with magnificent views of the expanse of Aubrac to Laguiole. In the village of Aubrac, a short stop at Germaine to taste the best cakes in the region and visit the beautiful 12th century village church, “Eglise Notre-Dame-des-Pauvres”. A little later you will reach the lively Laguiole, famous for its traditional knife manufactures, who have been producing pocket knives since the 18th century. A bee flaunts like a trademark on the back of the knife, but the individual adornments of the feather spine and a cross of small nails are also typical. It is said to this day that shepherds put the knives in the ground to pray before this cross. Particularly interesting is the visit of the smithy “La Forge Laguiole”. Here, you can be introduced to the secrets of blacksmithing of one of the most traditional family businesses. Shortly after leaving the bustling Laguiole, you will again be riding on wild, romantic paths in the direction of St Urzice. In the late afternoon you are back in the guest house of Monsieur Remise. A Buron invites you for a very special dinner with specialties in the best quality. In the former shepherd’s huts, today cooking is still done on an open fire. An unforgettable experience. 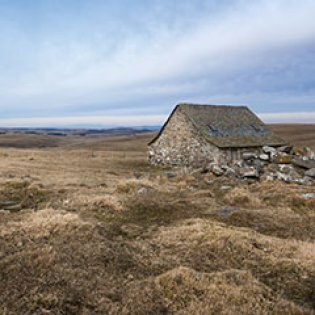 In the morning, a long downhill ride from the high plateau of the Aubrac will take you to Canourgue. The picturesque village core invites you to stay before the accompanying bus and a taxi will take the cyclists to approx. 900 m lake height, to the Causse de Sauveterre. 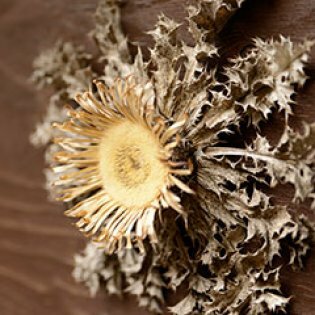 It is one of the four high plateaus of the Grands Causse and differs from the others due to its inhospitable roughness. Bizarre rock formations and seemingly unending stone fields are your companions until you reach the magnificent view of the Canyon des Tarns. The landscape changes increasingly as you start the long downhill ride to the valley. Fertile meadows and floodplains more and more replace the scarce landscapes; breath-taking rock walls determine the view now. Even the architecture grows richer and more playful. Houses are no longer rare. Many villages line the valley‘s bottom. In the afternoon, you will reach Ste Énemie, which has been named France‘s most beautiful village several times. From here, there are another 20 kilometers to the day‘s destination Le Rozier at the confluence of the Jonte and Tarn. The modern „Grandhotel de la Muse et du Rozier“ is a four-star-hotel with every comfort (pool) and a fine hotel restaurant. After breakfast, you will reach the Causse de Méjean after an hour by bus. Abandoned side streets and paths take you to Nîmes le Vieux, a bizarre rock sea the silhouette of which reminds you of the Southern French metropolis in the evening twilight. At least the Royal troops during the religious wars supposedly mistook this place for Nîmes. Across the wasteland and along seemingly unending dry rock walls, the segment will stop at the wonderfully retained Ferme Caussenarde. The small museum will illustratively present the hard life on the Causse de Méjean. If the schedule permits, you can visit one of the best cheese productions of the Causse de Méjean before returning back to Rozier. The Fromagerie de Hyelzas produces five different types of cheese with an outstanding reputation beyond the region. Late in the evening, you will return from the Causse de Méjean down to the wildly romantic Jonte valley by eBike. 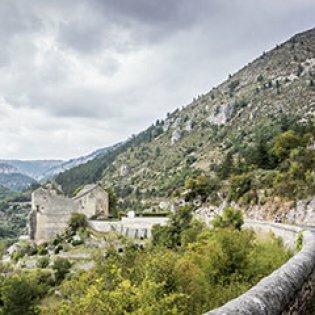 You will reach the „Grandhotel de la Muse et du Rozier“ after a downhill ride of nearly 20 km, interrupted only briefly by a rise halfway down, early in the evening. Meet for the final dinner in Rozier in a family-run restaurant, highly frequented by locals. Here we will celebrate the conclusion of a trip full of outstanding impressions with a top menu with regional specialties. In the morning, a bus will return you to Montpellier to the airport or the parking place, if guests arrived in their own cars. If the departure times permit, you may leave your suitcases in the starting hotel and explore this interesting town until you have to leave for your plane. You can also check in your suitcases and take the shuttle and tram back to the center. It is only 11 kilometers to and from the Montpelier airport. The taxi can take you to town or back to the airport in approx. 20 minutes. Visiting the Musée Fabre is perfect to bridge the time. It was founded in 1825 by painter François-Xavier Fabre. This museum houses approx. 1,800 paintings, 4,000 drawings, 1,500 graphics and several hundred sculptures. Since its reopening in 2007, the permanent exhibition has been showing approx. 800 objects. Among others, they are works by Gustave Courbet, Frédéric Bazill and Pierre-Auguste Renoir. Stunning views from above presented by Eric Perrin on France 3. From the same series pictures taken by a drone over the high plateau de Larzac and the Templars’ towns Ste Eulaie and La Couvertoirade. Impressionen of the Causse Mejéan. Famous Tarn valley including the Château de la Caze and the “Bateliers de la Malène”.